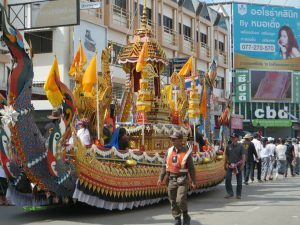 Surat Thani is the capital of the province of Surat Thani, which includes the islands of Koh Samui, Koh Phangan, and Koh Tao. We usually fly out of Surat Thani airport when we leave Thailand. Because of flight times and ferry times, we usually spend a night in the city of Surat Thani on our way through. 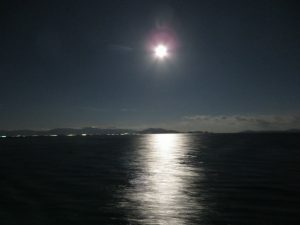 We took an evening ferry to the mainland, and the full moon put on a magnificent display for us. The next morning, things were a little different. It was the anniversary of the death of the king last year. The street outside our hotel was closed in the morning for a parade. The former king was truly a magnificent man, and the grief over his passing was vast and genuine. He was the longest-reigning monarch alive, having taken the throne before Elizabeth II of England. He focused closely on the welfare of his people, using his vast royal fortune to create health, education and business programs all over the nation. When the GFC hit, he moved all his personal wealth from overseas into Thai banks, to ensure the Thai banks didn’t become illiquid. We went to our regular breakfast spot, the patong ko outlet staffed by an incredibly elderly couple and several outrageously overweight three-colour cats. Patong ko is a breakfast of Chinese origin, essentially unsweetened doughnut dough. The pieces are pressed together in pairs so that they expand into butterfly shapes as they cook in hot oil. The Thai dip patong ko in condensed milk or super-strong, super-sweet coffee. Jenny runs with the coffee, and Ravi has hot cocoa instead. 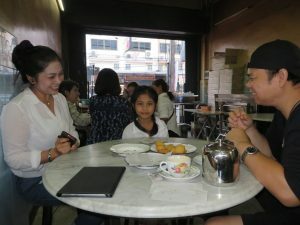 We enjoyed fascinated attention from this schoolgirl having breakfast out with her parents before going to class. 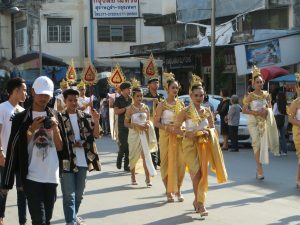 We had to walk out of the parade route to the Panthip office and board the bus to Surat Thani airport. It just goes to show how spoiled we have become from being picked up at our hotel on previous trips. Before long, we were up, up and away on our flight to Kuala Lumpur to meet Erin and Tammie as they arrived from Australia.